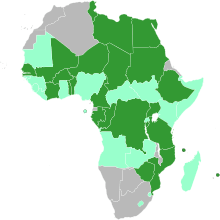 The following parties to the Bamako Convention attended COP 1: Benin, Burkina Faso, Burundi, Cameroon, Congo, Democratic Republic of the Congo (DRC), Cote d'Ivoire, Ethiopia, Gambia, Libya, Mali, Mozambique, Mauritius, Niger, Senegal, Togo and Tunisia. In addition, Guinea, Guinea-Bissau, Liberia, Nigeria, Swaziland and Zambia participated as observers. ↑ "Bamako COP 1 Decides UNEP to Host Secretariat | Chemicals and Wastes Policy & Practice | IISD Reporting Services". chemicals-l.iisd.org. Retrieved 2016-06-16.